A call came into the Geneva Shore Report today of a deer in trouble. The person on the other end of the phone was nearly unintelligible but finally calmed to the point that he could tell his story, the story of Charlotte the deer that thinks it is a horse. Two months ago a DNR (Department of Natural Resources) vehicle drove by the main pen for the horses and spotted the deer. A week later hey showed up a Mr. Graaf’s door with a request that they be allowed to euthanize the deer because no wild animal is allowed to be claimed from the wild without special permits. Permits which Mr. Graaf, as a private person, cannot hope to acquire. Mr. Graaf threw the DNR officials, with their guns, off his property. The DNR took their complaint to the Walworth County District Attorney’s office and informed ASSistant District Attorney Rea of Mr. Graaf’s violation. They informed the D. A. that the deer could not be returned to the wild because it was ill-equipped to survive there after association with human beings for so long and because it might take diseases from such association back to the wild members of its species. The Ms. Rea issued a warrant for Mr. Graaf’s arrest. The Sheriff went out, served the warrant, cuffed Mr. Graaf and then brought him in for printing and booking. Mr. Graaf is to appear before Judge Kennedy at Walworth County Court on the 21st of December to show cause why he should not be sent to prison for eight months and fined twenty thousand dollars and why Charlotte must die for Christmas. The Geneva Shore Report has taken up the cause of Charlotte and her plight. 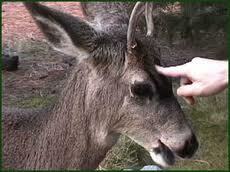 We vow not to allow this deer to be put to death to serve no valid purpose. We vow to attempt to have justice reign over law in a case where the two are so fully distant from on another. We have appealed to the DNR to no avail. The law is the law and as uncomfortable as it is for them they must kill Charlotte according to that law and their procedures. We have appealed to the District Attorney’s office but they cannot comment with respect to ongoing cases. We have apprised both the DNR and the district attorney’s office that whomever sits in judgment and finds that Charlotte must die will not make this decision lightly. The pubic will have a say in this. We are appealing to the Internet to help save Charlotte. It is within our and your power then we might keep Charlotte from having to die for Christmas. Next articleTyler August sponsors bill to increase real estate taxes. I live in Naperville, IL. I read an article from Mr. John Kass in Chicago Tribune on the night of 12/15. It was heart broken and I was wondering whom I could call to stop it. Then the next day (today, 12/16), here is a picture of Mr. Jim Strauss in Tribune showing a poster of Charlotte in Lake Geneva, WI. Mr. Kass reported today that Charlotte is now saved. The story reported by John Kass, the warm heart and compassion of Mr. Marvin Graaf, and the action by Mr. Jim Strauss show me that there is hope for better in this country. Thank you Mr. Jim Strauss for championing this “Save Charlotte” effort! You have brightened my Christmas!